The upbeat retro sound of Clap Stomp Swingin' proves that jazz knows no cultural bounds. With Swing Arcade the group take melody's and rhythms right out of 1930's New Orleans and infuses Japaneses singing that brings sunshine to the ears; even without understanding the meaning behind the lyrics, these sounds are joyful. The four piece from Osaka are Ryosuke Takada(Guitar) Takuro Yamashita (Clarinet,Vocal) Ryohei Kishimoto (Piano) Ichiro Saito (Bass), keeping the sounds acoustic and light. This throwback swing jazz starts with "When The Band Go Marching In" but stays away from the traditional melody and injects some great harmonization with it's bright vocals. The title track comes next and is a breezy jaunt highlighted by the Yamashita's clarinet. "Bravo Circus!" is an odd one which starts out ominous and dark, then goes almost into cartoon/anime land silliness before dipping into melancholy; this force feeding of emotional sounds is jarring. Speaking of jarring, the fuzz guitar and pedal effects on the over long "Sing Sing Sing" (while interesting) are completely out of place on this record, it is amazing the group chose to add it here instead of saving it for a future release that focuses more on experimental playing. Those tracks, along with the mellow piano focused "Nostalgia" are weaker points but things improve with the outfits take on the classic (and West Ham United theme) "I'm Forever Blowing Bubbles". The quartet work best staying staying weightless and floating from tune to tune. Other bright spots are the fantastic acoustic slide guitar blues on "Kmoichi De Swing" and the bass led album closer "When I Grow To Old To Dream" which finds Yamashita singing admirably in English. Each of the players get to flex their virtuoso playing on the popping "Tiger Rag" which not only acts a showcase for the groups talents, but also is an album high point. 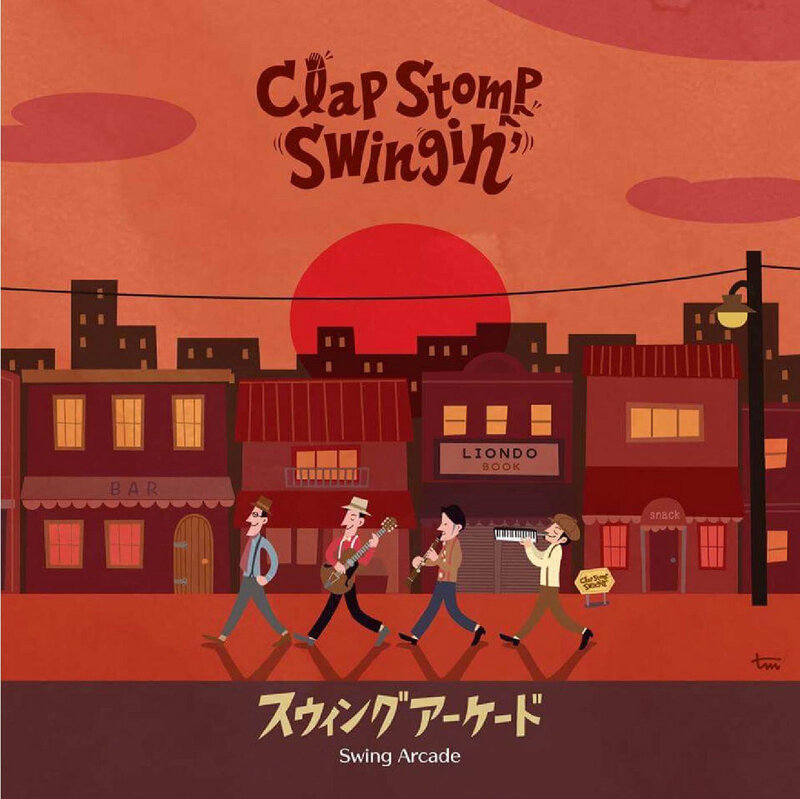 Clap Stomp Swing have clearly inhaled the acoustic jazz virus and expel it in glorious fashion on Swing Arcade; easily the most fun album we have covered this Jazz January it will bring an immediate smile to your face.